PharmaKeep, Oxygen absorber with drying function | Products | Mitsubishi Gas Chemical Company, Inc.
PharmaKeep can protect against oxidative degradation and extend the shelf life of pharmaceuticals. Oxygen and moisture in the packaging degrade pharmaceuticals. PharmaKeep can absorb oxygen and moisture. Putting it in the packaging, it can keep in low oxygen and low humidity. PharmaKeep is the oxygen absorber exclusive for pharmaceutical and medical device. Note: A hermetically sealed high gas barrier container is required to maintain low oxygen concentration. ※The absorbing rates depend on air volume, temperature, packaging material, application and etc. 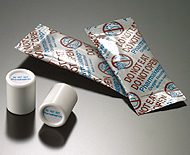 ※Canister type is jointly developed with Clariant. *The specifications may change hereafter. *Please refer to the"PharmaKeep® Information". Confirm the performance and effect of PharmaKeep by making the tests under the actual packaging conditions.